A few weeks ago I mentioned that I had ordered some custom aluminum pet tags as a cheap alternative to the pricey RoadID tags marketed to outdoor cyclists, runners, and other fitness enthusiasts who tend to leave important bits of identifying information behind when they hit the asphalt, making it difficult for rescue personnel to A) figure out who the guy/gal bleeding all over the back of the ambulance is and B) notify the loved ones of said bleeder in the event of an unforeseen accident. Well, my order from TagXpress arrived today, and I am quite pleased. My pink $7.00 ghetto version of the $19.99 RoadID identification tag for outdoor sports enthusiasts arrived securely packaged in a plastic baggie with a bit of styrofoam wrap and two sheets of cardstock to protect it. 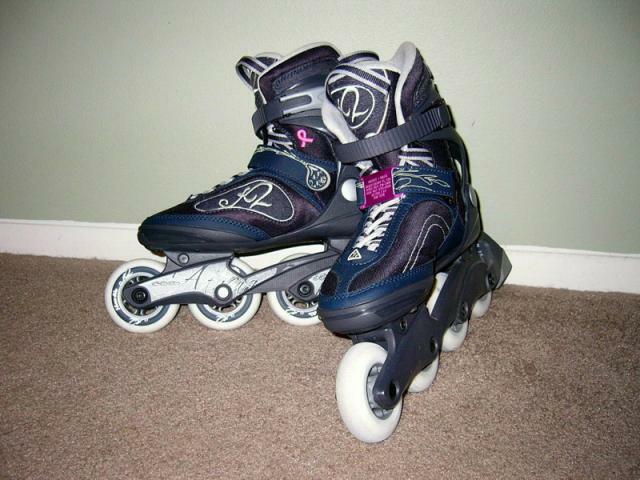 I got the 1″ size, which amazingly enough fits perfectly on the velcro strap of my K2 Athena skates AND matches the cute pink breast cancer awareness ribbon embroidery on the side of the skates. I got one for my husband, too, but his is a boring old black to go with his boring black and bronze K2 Exos.